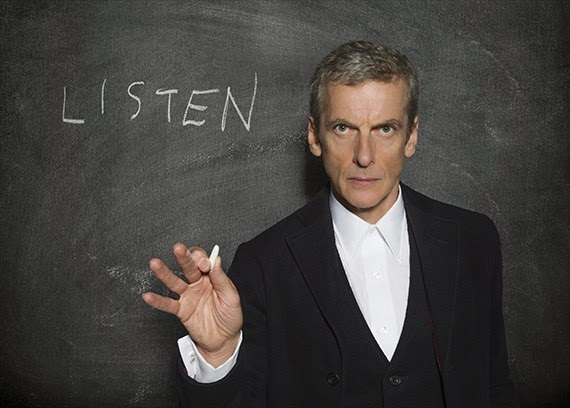 Doctor Who: Series 8 With Hindsight - LISTEN | Warped Factor - Words in the Key of Geek. 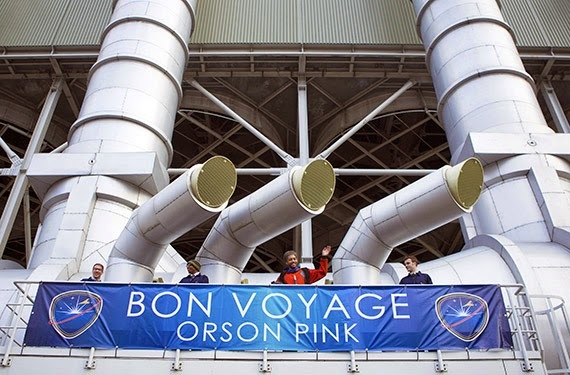 A year on, Tony Fyler asks if anyone’s still listening. On broadcast, Listen was another episode that divided fandom right down the middle. There were fans who railed against ‘The Clara Show,’ and there were fans who saw the ‘Fear Is A Superpower’ speech as being subtly explanatory of the Doctor’s whole life and career in space and time. It’s been a year now since we first stopped to listen. Let’s see what’s still hiding under the bed. As pre-credit sequences go, they don’t really come much more meta than this. It’s a radical departure to see the Doctor meditating on top of the Tardis while sitting in space, and it’s rendered with a gorgeous effects shot. But the idea of a fictional TV character, who exists pretty much to be watched, cottoning on to the idea that even when he speaks to himself, there are people listening – yeah, pretty meta. It’s also an idea from nowhere – the idea comes from the Doctor talking out loud to us, breaking the fourth wall to some extent. But it is an intriguing proposition, succinctly put and demonstrated in the pre-credits sequence. Once we get to the other side of the credits though, arguably, things start to fall apart. The Clara and Danny date feels awkward to watch, with its jagged terrain of false starts and re-tries, and you end up with two sensations – firstly that these people are trying too hard and don’t belong together, and secondly, that you’re watching a recycled script from Steven Moffat’s sit-com Coupling with occasional drops of time travel fed into the mix, rather than Doctor Who. We leap very suddenly from ‘things that might be silently there all the time’ to ‘things under your bed that inspire the nightmare that apparently everyone’s had’ (not as far as I remember, they haven’t. Just saying). It’s actually quite a big leap if you sit and think about it for half a second – perfect hiders, fine. Perfect hiders that grab you by the feet from under your bed – what? There’s also a slightly creepy glee about Capaldi’s Doctor, both while talking about what’s under Clara’s bed, and while covering her hands and forcing them into the pinkish goo of the telepathic circuits. But when they get to the children’s home, you’ve got a good five minutes of pretty much perfection. Yes, it feels a little weird that grown adults are breaking into a children’s home. And yes, actually, it feels weirdest when Clara – young, vibrant, fully-grown woman Clara – invites scared, lonely Rupert under the bed with her. We know it’s meant to be sisterly or motherly and to reassure a frightened child, but the knowledge of who Rupert Pink probably is, and how Clara feels about him when he grows up still gives a slightly odd note. But get over yourself and that five minutes in the children’s home is beautiful – everything from the Doctor launching a surprise inspection at two in the morning, to his stealing the coffee and stopping to acknowledge its taste, through the sudden spooked moment of someone sitting on the bed while Clara and Rupert are underneath it. Clara’s rationalisations about the fear being just what’s behind you when you sleep are beautiful, and there’s something creepily effective about the blanket-ghost that seems to grow in size without ever engaging. Best of all though is Capaldi’s “Fear is a superpower” speech. That is absolutely fundamental Doctor Who – you can tell because if you try, you can hear the speech in the voice of any of the Doctors. It sounds different in each of them, different stresses, different intonations, but each of them could have said it and you’d still have said “That’s the Doctor, nailed to the screen.” There’s something so perfect about what he’s doing, and why he’s doing it – getting them all to turn their backs on the creature that never ever wants to be seen (so why does it make itself known here in the first place? Logic-bomb! ), because having gone in search for it, he’s realized he’s effectively poking a wasps nest with a stick, and he has no idea what will happen when the wasps get angry. The experiment was supposed to be for himself and Clara, and he does what he has to do to keep an innocent bystander safe. Classic Doctoring. Clara’s taking care of business at the end of this scene delivers her some characterization-meat too, while setting up a long and quite complex running thread with the toy soldier who has no gun – Dan, Dan, the soldier man. It’s a very effective comparison – the Doctor might have done what was necessary. Clara does what is kind. Did I say the wheels started to come off after the credits? Apologies. 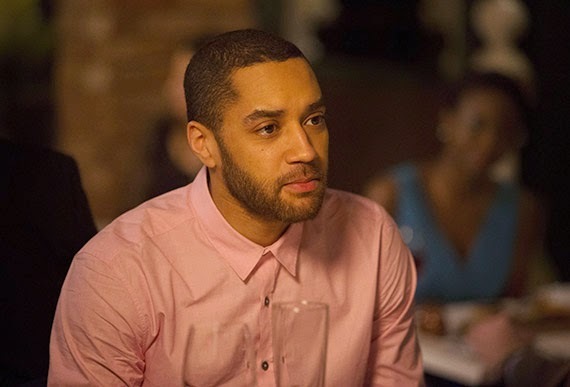 THIS is where the wheels start to come off – with the arrival of Orson Pink, future time traveler, who just happens to look exactly like Danny Pink. It’s with his arrival that, in hindsight, Listen really starts to look like two half-ideas cut and shunted together with a single thread. Orson’s been rescued from the very end of time, where he’s been stuck after his time travel went a bit wrong, and he’s been plagued by noises. The idea that the Doctor needs to know about the things under beds, or the silent hiders, because he’s genuinely worried he’ll be the last man standing in the universe smacks of self-revolution to a slightly ludicrous degree, even for a man currently living a life beyond even his own extremely long allotted span. And while there’s lots of Midnight-style mystery with things banging on the door of Orson’s ship in the hugely far future, and a creepy nursery rhyme (which Clara deliciously undercuts by asking the obvious question “Did we just come to the end of the universe because of a nursery rhyme? !”), it all seems a bit ultimately pointless given the rationalization that the Doctor’s scared of whatever’s under the bed coming to get him when he’s alone in the universe. – especially when you consider that he has a time machine, and need never BE alone in the universe at its end). All of which leads to the most divisive scene in the episode – Clara, getting them away from the end of time, just pops back to what we’re strongly encouraged to believe is the Doctor’s own youth, as a crying, lonely child with no hope of entering the academy and becoming a Time Lord. She becomes the thing under the Doctor’s bed, and tells him a soothing story of fear as a superpower, leaving him the gunless soldier a token of his power, his courage, and his wisdom – there’s a gorgeous moment of tying the whole thing together with a shot of the War Doctor and the location to which he came to unleash the Moment, and the whole thing is given its circularity by the idea that his later quest to find out what’s under his bed leads to his being told about fear as a companion, that can make us do good things, rather than bad. For me, this does still work after a year of distance, but really it’s one of about four or five things that do. Getting four or five things in an episode that work as well as they work here is no mean feat, and Listen still delivers an hour of interesting watching – the ‘threat,’ such as it is, is an intriguing look at fear and human nature, and the response to that, first from the Twelfth Doctor and later from Clara, is solid gold. But in the interim, time makes the links that hold Listen together feel flimsy – the date that tries too hard, the sleight of hand over what the hiders are, the tonal shift from the investigation of things under beds to the far future doppelganger time travelers, the dubious logic of the Doctor needing to know what the hiders are in case he’s left alone with them, the hindsight to understand the complications of Orson if Danny dies and, much as it pains me to say this, the charisma-vacuum of Samuel Anderson’s performance, no matter which Pink he’s playing, make Listen feel like quite a big pile of coal dust to sift through to find the nuggets of its golden brilliance. That they’re still there speaks of a really good idea. That they’re held together by quite a lot of forgettable or dubious connections makes it feel like it’s an idea that was developed and polished at too fast a speed, with ‘that’ll do’ material being allowed to get through the editing process once or twice too often.